يقع موتيل Chardonnay Motor Lodge ذو الـ 4 نجوم على حافة كرايست تشيرتش، ويبعُد 8 كم فقط عن المطار، ويوفر الموتيل أماكن إقامة عصرية ومكيفة مع خدمة الواي فاي المجانية. يمكن للضيوف الاختيار من بين استوديوهات ذات مخطط مفتوح أو شقق أكبر تحتوي على غرفة معيشة منفصلة. تحتوي جميع الوحدات على مطابخ صغيرة وتلفزيون إل سي دي كبير ويمكن وضع dds في الغرف عند الطلب. وتتم خدمة جميع الغرف يوميًا. يقع الموتيل ضمن أراضي كبيرة ويضم حديقة كبيرة. تشمل المرافق الترفيهية منطقة للشواء وملعب. يقع Chardonnay Motor Lodge على بعد 20 دقيقة فقط بالسيارة من وسط كرايستشيرش. تتوفر خدمة نقل مكوكية مجانية إلى كازينو Christchurch عند الطلب وخدمة نقل المطار المجانية بين الساعة 9:00 ص والساعة 10:00 م عند الطلب. Guests arriving after 21.00 hours should contact the motel before their stay to arrange an out of hours check-in. Please note that a free airport shuttle service is available between 09:00 and 22:00. To request an airport shuttle service, please use the special request box when booking or contact the property using the contact details found on the booking confirmation. We were here for a quick overnight stay. It was very good. No issues. Late check in. From airport. Left for Kaikoura the next morning. good location , tide place to stay and close to sports club . We flew in to Christchurch after a long flight from China, and it was so nice being met by the lodge's transfer service. The Chardonnay is only 8 minutes down the road from the airport and is in a beautiful rural type setting. Right behind the lodge is a winery in which to eat, and then behind that is a lovely, large park - this would be an ideal place to spend time in summer. The lodge has bikes that you are able to use to have a good look around. The units were clean, and spacious, and contained everything we needed. The owners were most helpful with any questions that we had. We would definitely stay here again if we needed accommodation in Christchurch. 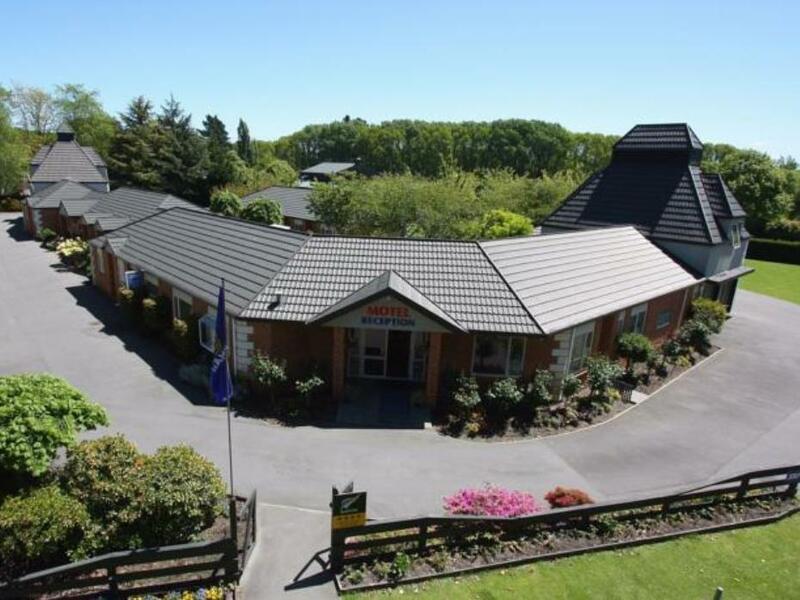 Situated where it is, is ideal for getting to any destination in Christchurch fairly quickly. The only necessity is that you do need a vehicle - but this is really the situation no matter where you decide to stay in New Zealand. Thanks for a brief, but lovely stay. Very nice with all the amenities and comforts of home. Welcome and friendly. Great location. We only stayed for one night, but this accomodation would be great for longer stays also. Very impressed with the room and the grounds of the Lodge. The owner was very helpful in all our needs. Great for couples and families. Nice choice. Appreciated the free wi-fi also. Clean and tidy rooms , serviced daily. Free internet. TV and video. Good place to come home to. Not walking distance to shops, so need transport, but quiet and restfull. Management lent us towels for a day trip. All in all a good stay. modern; warm; no signs of wear. late arrival was handled well. room was warm on arrival. has a wide range of utilities - would've appreciated a pair of dressing gowns as these are heavy for the air traveller to carry. bed was comfortable - extra blanket provided. shower works well - good flow of hot water. room was serviced thoroughly after the first night. we didn't hear any noise from other guests or from passing cars. would return again in future. We enjoyed our stay at the Chardonnay Motor Lodge. We were attending a funeral and wanted a quiet motel with kitchen facilities. This motel offered all that we were looking for. We regretted not booking an hotel nearer the centre of Christchurch or at least on a bus route in. Taxis in & out were about NZ$35 a trip. We were upgraded to a spacious "house" appartment but found a cat in the main bedroom so used the second. (Friends in another room thought there was a cat smell in theirs too). Downstairs was spacious and nice. The only restaurant nearby is the Rosebank "Winery" next door but they have restricted hours and although the surroundings were lovely, the food was variable quality and the poor serve not dealt with. We didn't want, to stay inside Christchurch and this was perfect. The motel is just off John's Road which is a major highway, so there is a serious problem with traffic noise, in spite of the motel's beautiful rural location. Clean rooms, good facilities with good service. very happy with service! staff were friendly and helpful as i arrived early but room was getting cleaned so they accommodated me into another room. Convienient to the airport and nice parks. Room was good for our family and staff were friendly. Quiet, nice garden and near to an retired Vineyard. they will be extra charge for children above 5 years old. hotel is about 6-7 km away from main christchurch's city centre. That said, room is comfortable and clean. This motor lodge accommodation was very attractive, set in lovely grounds, and in a very good location - handy to so many places one needs to get to - the Airport, good shops, restaurants. I am very fussy about clean hotels as I run my own cleaning business and I can say that its cleanliness was of a very good standard. Especially as a couple having time away from our children(!) we loved the size of the room, and the setting - we looked out onto lovely garden area and could relax and stroll next door to the fabulous vineyard restaurant and enjoy good food and lovely atmosphere. All in all a wonderful couple of days! we checked-in with good surprize because the owner upgraded our room to a bigger unit without extra charge, which made our stay more comfortable. the owner was very nice to offer free drive to supermarket too. the room is clean and good surrounding with nice garden.